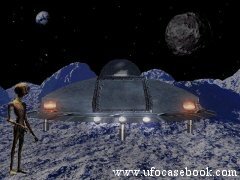 03.10.2007-One of Russia's central television channels, RTR, has recently aired a documentary about US astronauts who allegedly came across extraterrestrial civilizations. The film showed Russian ufologist Vladimir Azhazha and astronomer Yevgeny Arsyukhin telling that expeditions to the Moon launched within 1969-1972 allegedly came across UFOs. Neil Armstrong, the first man to land the Moon, is now living an anchorite life in Ohayo where he teaches astronautics at the university.